Hi, I'm trying to work on finishing UFO's and came across this almost finished quilt top, with no pattern, of course. I have the appliqué pieces for the last teddy bear, but can't remember the rest. I THINK each teddy bear had a balloon. This was MAYBE from an old Quiltmaker magazine, but who knows which one of the hundreds I have. Does anyone recognize the pattern, and can help me? Please excuse my "girl"- why DO they think anything put down is for them!! Thanks!! She is just trying to tell you how she would finish the quilt!! Don't think I have that pattern, but balloons would be cute! I don't know the pattern but I would think balloons and/or kites would look great. I made one like this years ago for my great nephew, he is now 12!!!!!! ​I vote for a kite on a string. Balloons for sure! Kites would not fit? Found it! 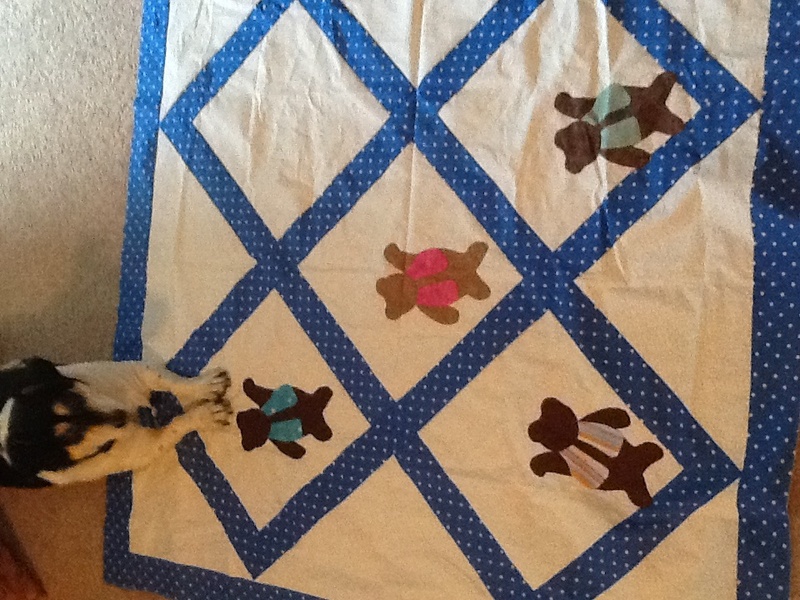 Teddy Bear Party, Quiltmaker, May/June 03. Each bear holds a string of balloons, with extras spread here and there. Booboo and I thank you for the input! A kite would fit into the next blank square. Either balloons or kites would be fantastic. I have to agree ballons or kites would really looks cute. I think different colored balloons would be really cute and add more color, make it look brighter. I really like this idea of kites in the adjacent empty square. Especially if it's for a boy. If it's for a girl, then do a cluster of balloons or a big bouquet of flowers (might be tricky as an applique ). I agree. Balloons would be terrific in so many different colors and patterns....endless. It's really cute. It might even be kind of cute if some balloons went outside the box and onto the frames (or even into the box above). Either kites or balloons or why not both? Your girl is adorable! There are so many possibilites with this quilt: balloons, kites, flags and who knows what else ? so many possibilites just imagination at work ..
the pattern was also in the Old Stitch & Sew 1960's. I made for my little girl. Glad you found the pattern and can finish the quilt. It's adorable and will make a lucky child very happy! What a darling baby quilt this will make with bright balloons. I agree with the balloons. It already looks like the bears are being lifted off the square! A few color balloons would make the bears come alive off the quilt! OH, I thought you meant the dog - do I recognize what kind it is? No, what kind is it? The quilt is cute, too! I agree ! That would be sooo... cute! Cute quilt!